Yokogawa Electric Corporation announces the September 30 release of an enhanced version of the ProSafe®-RS safety instrumented system and the addition of a new function to the DPharp EJX multivariable transmitter. The new ProSafe-RS version, R3.02.10, offers improved functions for upstream oil and gas, which is one of Yokogawa's core markets. The DPharp EJX multivariable transmitter has been enhanced to improve connectivity with ProSafe-RS. In upstream oil and gas processes, there is an ever pressing need to prevent accidents and protect the environment. Accordingly, there is a growing demand for safety instrumented systems that can detect abnormal conditions and safely initiate emergency shutdowns. However, wells and pipelines are typically distributed over a wide area and often have limited space for the installation of equipment. To improve operational efficiency and reduce hardware costs, there is a need to consolidate the functions performed by control and safety instrumented systems. In response to these needs, Yokogawa is releasing a new version of the ProSafe-RS safety instrumented system and has enhanced the DPharp EJX multivariable transmitter. To monitor and control gas wells and pipelines, gas flow rate compensation is required. The in-situ gas volume needs to be compensated to a standard volume because the gas volume rises or falls significantly depending on the process temperature and pressure. This compensation is usually carried out by a control device or dedicated flow computer. For our customers in regions such as the Americas and the Middle East who wish to eliminate the need for such dedicated devices, Yokogawa has incorporated a gas flow rate calculation function in ProSafe-RS R3.02.10. Thus ProSafe-RS, which is certified for use in SIL3*1 applications, is now suitable for use both in safety instrumentation and monitoring & control. To compensate the gas flow rate, differential pressure, static pressure, and temperature must be measured. The DPharp EJX multivariable transmitter is a sensor that can measure all three of these variables. As the Modbus protocol is widely used in upstream oil and gas processes for communications between sensors and gas flow rate compensation devices, Yokogawa has added Modbus protocol support to the DPharp EJX multivariable transmitter. This sensor can thus be used together with ProSafe-RS to perform highly reliable and accurate gas flow rate calculations. A variety of networks are used to link ProSafe-RS at the site to the Yokogawa FAST/TOOLS SCADA system. Some networks use high-bandwidth optical fiber, while others rely on low-bandwidth wireless links. By optimizing the frequency of data collection and the volume of transmitted data, ProSafe-RS R3.02.10 can now link up with other systems using low-bandwidth media. This improves maintenance efficiency by enabling remote engineering. 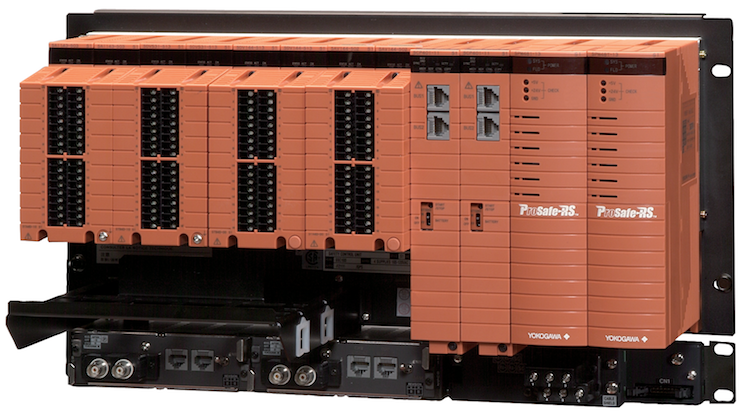 Essential data is stored on the ProSafe-RS controller, ensuring continuity in the event of a network failure. In the oil, natural gas, petrochemical, iron & steel, and other energy and basic materials industries, it is important to ensure the safety of plant operations and thereby fulfill our obligations to society by preventing accidents and protecting the environment. Released in February 2005, the ProSafe-RS safety instrumented system helps prevent accidents by detecting abnormal conditions in plant operations and initiating actions such as an emergency shutdown. *1 Safety integrity levels (SIL) are defined by IEC61508, a standard relating to the functional safety of electrical and electronic equipment. At SIL3, the risk factor for a plant where safety measures are not in place has been reduced to a range from 1/1000 to 1/10000. *2 An industrial communications protocol developed by the U.S. company Modicon (now owned by Schneider Electric). The names of companies and products in this text are registered trademarks or trademarks of the respective holders.